Rep. Hong Joon-Pyo, the floor leader of the ruling and conservative Grand National Party (GNP) was elected as president of Korea Taekwondo Association (KTA) in a KTA general meeting on June 11, 2008. Hong Joon-Pyo, the floor leader of the Grand National Party-Hannara, was elected as the 24th president of Korea Taekwondo Association (KTA) on June 11, 2008 during the KTA general assembly held at Seoul Olympic Parktel in Bangi-dong, Seoul. Cho Young-Ki, president of Joennam Taekwondo Association, resigned the day before the election supporting Hong in public, so the election processed with only two candidates. Hong earned 16 votes among total of 24 votes and won the election over president of Busan Taekwondo Association, Kim Sung-Tae who earned eight votes. The newly elected KTA President Hong will be at the helm of KTA for four years and seven months until January of 2013 including seven months remainder of former KTA President Kim Jung-Kil's term. Hong said that he was frustrated with the stagnation of Taekwondo due to some past presidents' absurdity and decided to run for the president position in order to support and spread Taekwondo world widely as the national sport, according to Yonhap news. "I promise that I will make an entry to extend Taekwondo abroad for young Taekwondo masters," Hong said. Beside the overseas expansion of Taekwondo, Hong also presented election pledges such as fair and fun Taekwondo, revitalization of Taekwondo and maintenance of Taekwondo as an official sport in Olympics. 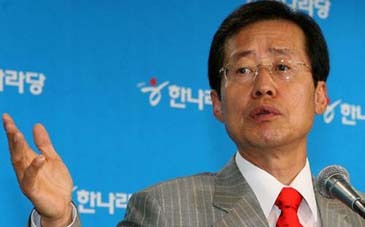 When Hong came forward as a candidate of KTA president, he was blamed for his decision and was told to give up his candidacy from Kim Hyun, spokesperson for United Democratic Party on June 5, 2008, according to Newsis News Agency. "It is unbelievable that the floor leader of GNP Hong is running for KTA president position just to fulfill his ambition despite the fact that the approval rating for GNP has plummeted to 10% range only 100 days after President Lee Myung-Bak's inauguration," Kim said. "I hope that Hong would focus more on reflecting public opinion." Some people affiliated with KTA also voiced up that they should not let any politicians lead KTA but let someone who has a pure spirit of Taekwondo without any political goals to steer KTA in the right direction. KTA staff members who approve of Hong as KTA president, however, said that powerful politician in KTA president position will greatly support for the development of Taekwondo. "I will be fully dedicated to KTA only as a purely spirited man in Taekwondo and I promise to serve KTA not for my means but only for its fixed goals," Hong said. KTA was established in 1961 to promote Taekwondo as Korea's national sport and martial art of self-defense. KTA focuses on raising nation's cultural level through bringing up the best Taekwondo players by guiding all the amateur Taekwondo associations.